With a vast array of choices out there, how can you find the RV generator that meets your needs without busting your budget? As a fellow RV owner, I know how important these decisions are. This is a big purchase, and it is an important one to get right. 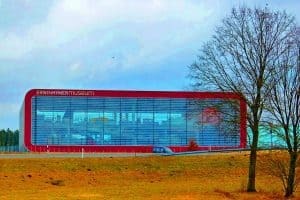 That’s why I have compiled all of the information you need to find the right generator for your RV. Decide how you will be using your trailer or motorhome. Those who will be using their generators often and for long periods of time (boondockers and full-timers) will find that a more costly-and-reliable option will make the most sense. Make sure you buy a generator with enough power for your needs by calculating the electric load of your most power-hungry RV appliance (usually the AC). Consider the size and noise levels of the units on your list and cross off any that do not fit your needs and expectations. Read up on the various models that fall within your requirements. Below is a handy list of the highest-rated generators within each size category. So, just how do each of those considerations play into your RV generator decision? Keep reading as we discuss each category in depth and then talk about some of the best generators on the market. How do you Use Your RV? Let’s face it, everyone has a slightly different way of using their RV. Perhaps you are the type who likes to get as far away from people and cities as possible, or maybe you just want a nice, developed spot next to a lake or point of interest. Next, are you one of those intrepid folks looking to live out of your RV full-time, or do you enjoy using it on the occasional weekend trip? There are many different ways to use an RV, so be sure you understand just how you will be using yours before deciding on a generator. 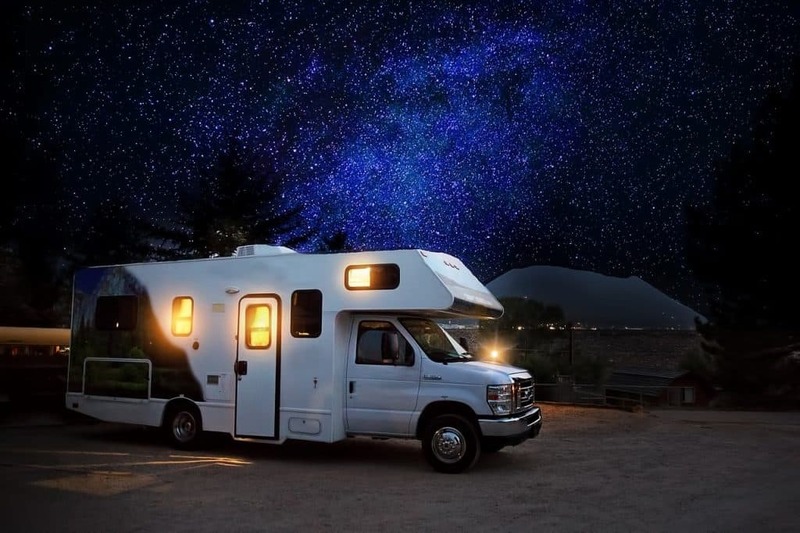 How much time will you be spending in the RV? Will you always have access to shore power, or do you prefer to camp outside of established campgrounds? All of these factors are important in deciding just what kind of generator meets your needs. Probably the biggest question to ask yourself when deciding on an RV generator is whether you will be boondocking or camping in campgrounds. Boondocking, or dry camping, generally refers to camping at free sites, away from campground facilities. 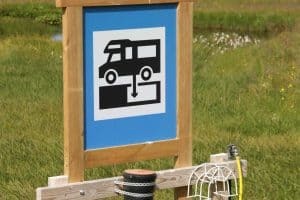 As you can imagine, then, you will not be able to plug your RV in while boondocking. This means that your generator will have to work extra hard to keep your RV running. Consequently, if you want to be able to fully use your RV while camping, a generator is a must when boondocking. The only exception would be if you plan to use a complete solar system to run your various appliances and lights. With no hookups to power your RV, a strong, reliable generator will give boondockers assurance that their batteries will stay charged and that you will have access to your various appliances and outlets in your trailer or motorhome. Anyone who will primarily be camping at campgrounds will not need to rely on their generators as much as dry campers. That’s because most campgrounds will have 30 Amp outlets to plug into, which is enough to run everything in your RV. If you plan on camping in large, established campgrounds, a generator will not be necessary. 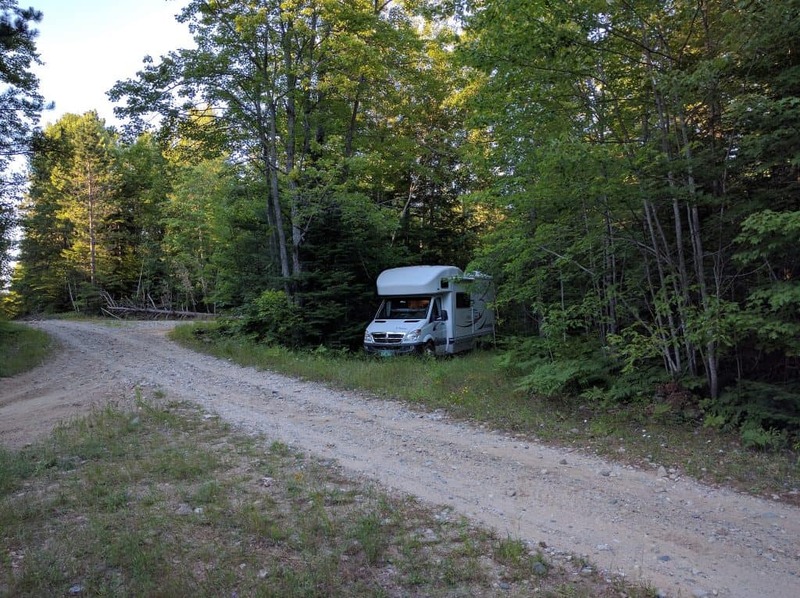 That is, as long as everything at the campground works properly and you are able to secure spots with hookups every (or at least most) night you are camping. It is important to research the campgrounds you plan to stay at in advance, however. 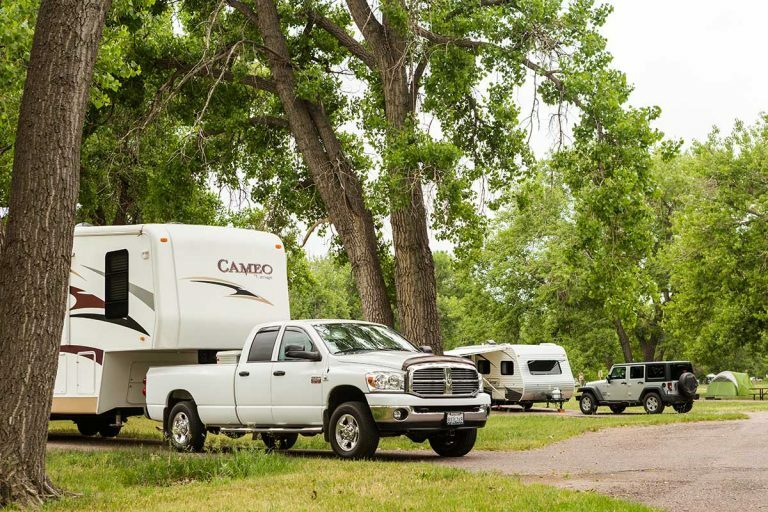 That’s because some campgrounds will only supply 15 or 20 Amp power sources, which is not enough to power everything in your trailer, especially if you need to run more than one appliance at a time. Not having enough Amps to run everything you turn on can even damage your appliances, so a generator becomes necessary for those sites without enough power for your RV. One last thing to note: While finding a site with full hookups is great, it is not always a possibility. So, unless you are supremely confident that you will always have a secured campsite, a generator can be a great backup to take along with you in case of emergencies. Next, let’s discuss how much you plan on using your RV. 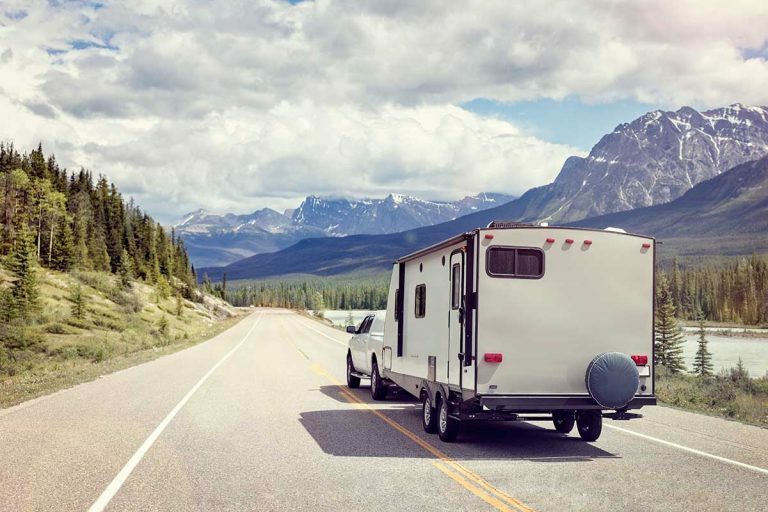 While some of us only use our RVs a few weekends each year, others plan on making their recreational vehicle a permanent or semi-permanent residence. These are obviously drastically different ways to use an RV, so it’s only natural that generator needs will vary by RV use. Those planning on living out of their RV all year, or for a significant portion of the year, will most likely have to use their generators more than us weekend warriors. It stands to reason that the more nights you use your RV, the better your chances are of spending some nights without hookups. Right there, we find a reason that a generator is a good idea. But that’s just the beginning. Another consideration is reliability. Full-timers will need to do their research and find a high-quality generator that will not break down frequently. Usually, this means investing a little more money (at least upfront) in their generators. This will ensure that you have a solid, reliable generator that you can rely on for many years to come. After all, if you find yourself without power and your generator breaks down, it will likely be impossible to simply pack up and go home! 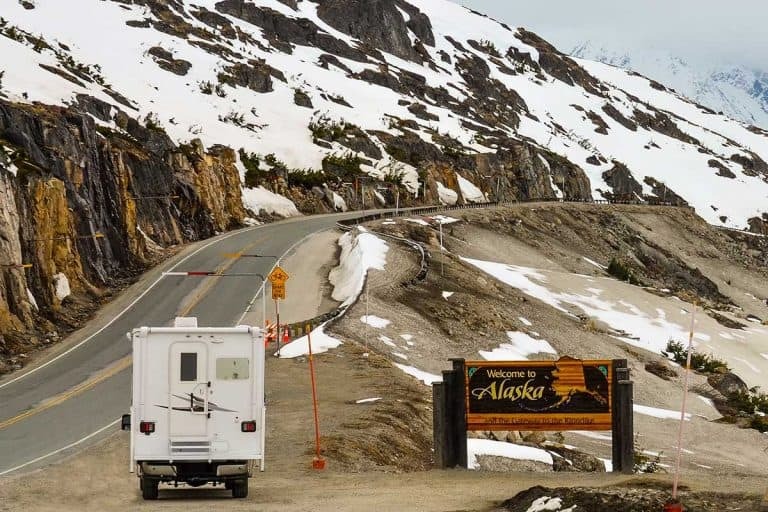 If you really only plan on using your RV for one to two nights at a time and are okay with the risk of not having hookups, a generator may not be strictly necessary for you. Personally, I decided to sell my generator last year because it simply wasn’t worth the expense and effort to use it. If, like me, you are willing to risk not being able to use your air conditioner, outlets, and microwave, a generator becomes a costly and unnecessary backup. At some point in the future, however, if I am able to spend more of my time camping (especially for extended periods of time), I will make a generator purchase the first thing on my list of RV improvements. Most weekend RV campers will probably still want a generator, however. After all, you paid for these appliances, so why make sure you are able to use them? Especially if you like to get away from the busy campsites and boondock, a small, portable generator can be just what you need to get the full use out of your RV. What Exactly Do You Need a Generator For? At this point, some of you may be wondering just why the generator is so important. After all, your RV comes equipped with a battery and propane tanks to power everything, right? Well, not quite. Most RVs will be able to run the lights, fan, and stereo off of batteries alone. The propane system can run most refrigerators and can be used for the stove and furnace. But for those wanting to use everything in the RV, an external power source will be required. The various features and appliances requiring more power than the batteries can provide include the microwave, air conditioner, 120-volt outlets, and the refrigerator when it is in electric mode. Because most RV owners purchased their RV at least in part so that they can have access to these niceties, they must find a way to power them. That’s where the generator comes in – they are the most common and convenient way to power those devices when hookups are not available. But there are other important functions a generator can provide. For one, they can charge up your batteries. If you are using your RV heavily, these batteries can drain very quickly. It is recommended to never let your RV batteries drain to more than 50% of their capacity. Letting them get too low can cause permanent damage that severely affects their ability to hold a charge. Monitor the status of your batteries and fire up the generator to get them back up to 100% again. This can typically take up to 2 hours. Some RV owners are also looking for a unit that can be used as a backup to power their houses in case of a power outage. For frequent outages, a large generator will be most helpful, but even a mid-size unit can help with infrequent, short-term outages. Most larger generators will be able to plug right into your breaker panel and run most or even all of your household appliances during blackouts. Believe it or not, many people enjoy bringing small generators along to events like tailgating or outdoor parties. After all, isn’t it nice to have access to all of the same things you enjoy while camping during those situations as well? Plug in a TV or heater, and you will be the most popular person at your event. One of the most important considerations when buying your RV generator is the size of the unit. Finding the right power for your uses can be tricky, so let’s dig in to discover what will work best for you. First, you will need to find out how many watts are required for your most power-thirsty appliance. This is usually going to be the air conditioner, which needs a higher wattage to start up than to run. So, find out how many watts are required to start your AC (or whatever your neediest appliance is) and find a generator that can produce that much power. Consumer Reports breaks generators down into three distinct categories based on size. Usually weighing under 60 pounds, these recreational generators are popular with small RV owners. They usually cost between $500 and $1000, which is actually as much as many generators in the large category. Because they are relatively lightweight and small, they make for an appealing option for anyone who doesn’t need a ton of power. But with 2,000 watts or less power, they can be too small for some uses. For example, these will not provide enough power to use as a backup for your household power system. Typically, 2,000 watts will be enough to power a 10,000 BTU air conditioner. If your AC is larger than that, look to the next categories to meet your needs. On a personal note, in the past I owned a Yamaha EF2400iS generator to power my Forest River RPod 179. It never let me down; quiet and easy to use, it was the perfect match for that trailer. At between 80 and 150 pounds, you will want to hit the weights to prepare for lugging these mid-size guys around. Luckily, the heavier units typically come with a pair of wheels to help when moving it around. The good news is that you can often find a great mid-size generator for a very reasonable price. And while they are harder to carry, they are still quiet enough to tolerate for long period, making them a great middle-ground option. At around 250 pounds, the largest class of generators will come on wheels as they are too heavy to carry around. They are also powerful enough to power your house and often come with a transfer switch so you can do just that! This can be a big upside as you consider your purchase. And because they are often under $1000, it can be easy to start thinking that you should just go ahead and buy one of these, even if you don’t need all of that power. Before you go down that path, here are some major downsides to consider. First off, at over 200 pounds, these are too heavy to lift in and out of your vehicle easily. That’s why many A-class motorhomes come with one mounted to the RV. You will also want to make sure you really need all of that power. More than 5,000 watts of power is overkill for anything but the largest RVs. And, as you could probably guess, these monsters use more fuel than the small, inverter-type generators. 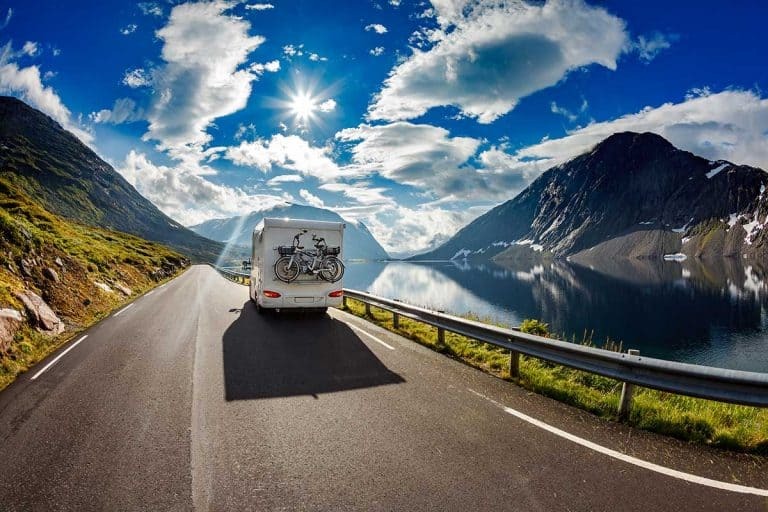 It can be hard to decide what option is best for your RV. I would suggest finding a generator that provides more than enough power for your RV, but not by too much, or else you will just be wasting fuel as you run it. There are two main common types of generators on the market today. Keep in mind that there are also generator alternatives that are basically just large power banks you charge at home and use as needed while camping. Conventional generators are fairly simple in their operation. They use an engine that can run on either gasoline, diesel, or propane. As the motor operates, an alternator converts the mechanical energy produced by the engine into an electrical current. These generators have been around for a long time, so by now they are fairly inexpensive to purchase. Keep in mind, however, that they do come with some disadvantages. The main drawback is that they must run at a constant rpm to produce the current required by your appliances (120 Volts at 60 Hz). That means that if the motor speed fluctuates for any reason, so does the current it produces, which can interfere with or even damage your appliances. I will briefly describe how these types of generators work, without getting too caught up in the science behind them. This fairly recent technology converts the AC current produced by the generator into DC current. That current is then inverted back into “clean” AC voltage. The advantage to this process is that inverter generators create a clean, constant flow of electric current. Inverters are generally recommended for powering any sensitive electronics, like microwaves, TVs, or computers. All of these devices contain microprocessors, which are sensitive to fluctuations in current. Inverters are able to change the motor speed in response to demand because their electrical current output is always consistent. Another great thing about inverters is that you can hook two together to double your power output. This is called running in parallel. Inverters tend to be more compact than traditional generators. This often means that they come with a smaller fuel tank as well. And while they are more fuel efficient than their older counterparts, this can still mean that they cannot run for as long as traditional generators. 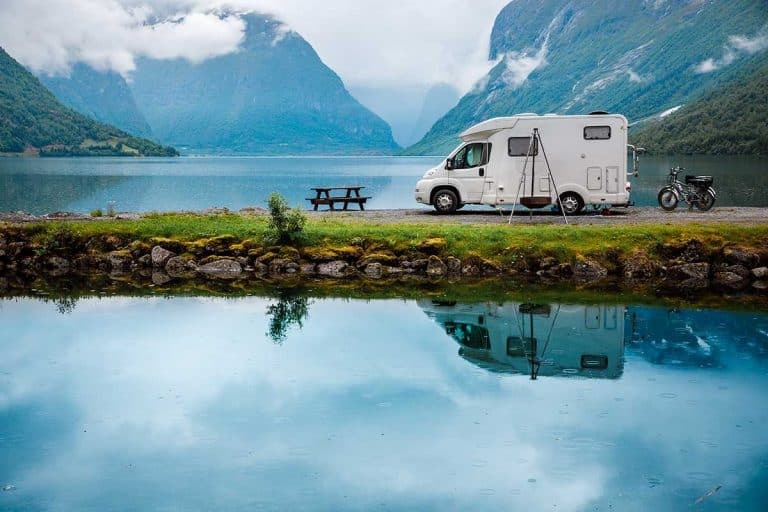 Now that we have begun to narrow down the main criteria for your RV generator, it is time to start thinking of a few other aspects before you decide to buy. How much will you use the generator? If you plan on running your generator often or for long periods of time, that can change what you are looking for in a generator. It will be important to find a good quality unit that is up to the task. While most large generators are made to last, some of the cheaper, smaller units can be less reliable. Most users report having the best luck with Honda and Yamaha products. How much noise can you handle? Let’s face it, some of us are better at tolerating noise than others. If a noisy generator will drive you up the RV wall, make sure you find a nice, quiet generator before you buy. The good news is that many of today’s generators are quiet and easy to listen to for long periods of time. If you happen to find a noisy generator, however, it can really ruin an otherwise fun RV experience. For those seriously averse to generator noise, there are some new, silent generator alternatives available today. Take, for instance, this Goal Zero Yeti 3000. Charge it up at home or by using solar panels, and this generator will store the charge. So, when it comes time to use it, there is no noise and no fumes. Rated at 1500 watts, it is a pricey option, but for those seeking the quietest and/or most environmentally-friendly option, it is hard to beat. 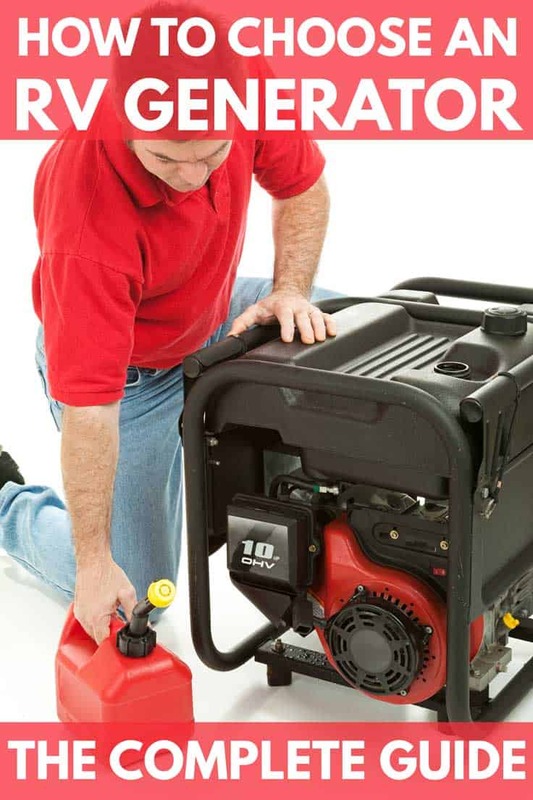 How often are you going to need to carry your generator around? How high will it need to be lifted? While an 80-pounder might be fine for some, it could prove to be just too heavy for smaller or elderly people to deal with. Make sure you factor in the weight of your generator when you calculate your load, as well. Some of these units can really throw off your weight distribution, so be sure to place the generator in the optimal spot to prevent trailer sway. Also, do you have enough space for it? Generators are not small, and they can be hard to pack up if you don’t have a lot of space. So, be sure to plan where and how you will store your generator when you are travelling and at home. Be realistic about your limitations and make sure your new generator isn’t too heavy or bulky to use. It would be a shame to be unable to use your expensive new generator because it is just too big. This article dives into the details of RV generator fuel types, but here I will include a short schpiel about each fuel type. Keep in mind that some generators feature the ability to run on more than one type of fuel. Propane burns clean and lasts for a long time. These generators are usually quiet and easy to maintain. It can be more difficult to find propane than, say, gasoline, however. Many, but not all, gas station will have propane filling stations outside. Diesel generators are usually found on diesel motorhomes. They produce tons of power, and diesel is more stable than propane or gas. Diesel generators tend to be more expensive than their propane and gas rivals, and they make more noise as they operate. The most common generator fuel is gas. Gas generators are relatively quiet but require more maintenance than propane generators. Easy to find and buy, gasoline has its advantages. Keep in mind, however, that gas is nevertheless more dangerous to store than the other fuel types, and it produces dangerous fumes as it burns. What’s the Best Generator for an RV? As you can probably tell by now, there is no “one size fits all” answer to this question. Your needs will vary based on your RV and your planned uses for it. That said, below is a brief list of the highest-rated generators in each size. The Japanese companies Honda and Yamaha dominate the small generator category with their 2000-watt and under inverters. Consumers love their flexibility, reliability, and low noise levels. Moving up, the larger categories see traditional generators taking over, as inverters typically top out at 4000 Watts. Champion products tend to receive the most favorable reviews on Amazon. And, as you will see, price does not necessarily go up as the size of the generator increases. That’s partly because the smaller inverters use newer technology, so they cost more to manufacture than traditional generators. Small, reliable, and quiet, this handy little inverter is highly popular with small trailer owners. Honda is built on a reputation for reliability, so you know what you are getting with their products. This inverter is also quiet and efficient, so the only downside is the high price point. While this DuroStar is a tad noiser than the smaller inverters, it does use a muffler to keep the noise level down to just 69 decibels. Owners love this unit, and it comes at a fantastic price as well! Champion makes some great generators, and this one is no exception. One of the largest inverters, on the market, this unit will set you back a little more than a traditional generator, but it still represents a great value. Runs at 64 dBA. Capable of running on either gasoline or propane, this Champion generator makes enough power for just about any RV or home. Another great large generator is this one made by Westinghouse. Reviewers find this generator to produce tons of power with little to no problems along the way. What is the Quietest Generator for an RV? 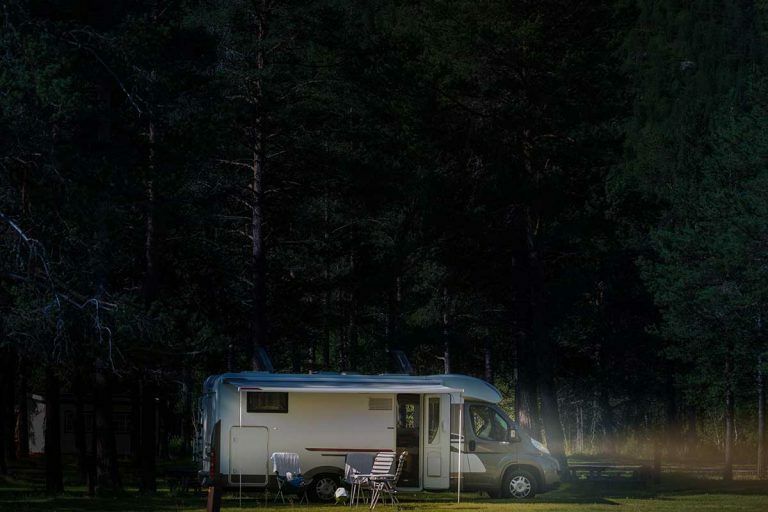 Because you and probably several other campers will be living in close proximity to your RV generator, the noise level is of most importance to many buyers. As you would expect, inverter generators take the cake when it comes to noise, so that’s where you will want to start looking. This article from chainsawjournal.com takes finding the quietest generators very seriously. They found that the Champion 3100-Watt runs at just 58 dBa from 23 feet away. That’s quieter than a typical human conversation. Not bad! Another great option for those wanting a smaller inverter generator is the Honda EU2000i. This small generator has a staller reputation for reliability, and the noise level clocks in at a respectable 59 decibels at full capacity, or just 53 decibels at 25% load. One even quieter option at partial load is the Yamaha EF2000iS. When running at 25%, this inverter produces just 51.5 decibels. That’s about as quiet as it gets, folks. So, what’s the takeaway? Unfortunately, the answer is up to you. Only you know what your needs are. After deciding how much power you need and how much you are willing to spend, you should be able to quickly narrow down your options and decide on a generator that works best for you. The main things are to be safe (never run your generator indoors) and have fun!! Looking to get more technical? Try our in-depth analysis of types of RV generators too. Next PostWhen Should I Replace My Trailer Tires? 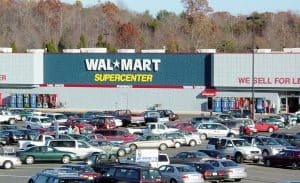 Can I Park My RV at Walmart Overnight? Very good article. Well written and thorough. Great for someone like us who is plunging straight into FT RVing and have never owned a 5th wheel. Thank you. So glad you liked the guide. Thanks for leaving a comment!